When Oman Air announced flights to Singapore, the aviation community got very excited, including myself. This airline has caught our attention with its beautiful livery. Photos credit to the respective photographers. Flying with this airline was a must and the great news is that there is 5th freedom rights on the Singapore to Kuala Lumpur sector. I just need to decide on which dates and May was the best time to go. Since I had an unused Air France's CGK-SIN ticket, I decided to create an exciting joyride itinerary, which involves a one day stopover in Singapore, sounds strange? Read on to find out. Initially, I was thinking of just doing a day trip there and back, but looking at the timing of this airline, it wasn't possible as the timing requires me to stay overnight at KUL. I decided to do CGK-SIN on the same trip, and it became like that. Later on, I decided to add in a day trip to YOG (Yogyakarta). This airline was found in 1993 and started flights in March on a domestic route with a leased Boeing 737-300. Gradually, the airline grew bigger with more destinations added to its profile. Aircraft were leased and this airline briefly wet-leased a couple of Airbus A320s from Region Air of Singapore to replace its Boeing 737-300 Classics. The airline struggled until 2007 which the government came into the picture by recapitalising the airline. The government decided to pull out of Gulf Air and concentrate on developing Oman Air. On April 2007, the airline announced an order of new aircraft consisting of Boeing 737-800s, Airbus A330-200 and -300s and Embraer ERJ-175s. In 2010, this airline was the first to offer mobile phone and WiFi services on board on selected flights and have seen become a force to reckon in its own region, of course not as big as the likes of Emirates, Qatar and Etihad. If everything goes to plan, the airline will operate 50 aircraft by the end of 2017. Whether the airline will join one of the 3 alliances (SkyTeam, Star Alliance and OneWorld) remains to be seen, but its future looks bright and I am delighted to be able to sample the airline's Economy Class product even though the flight is short, thanks to 5th freedom and the cheap airfare. This airline would be my 75th airline. 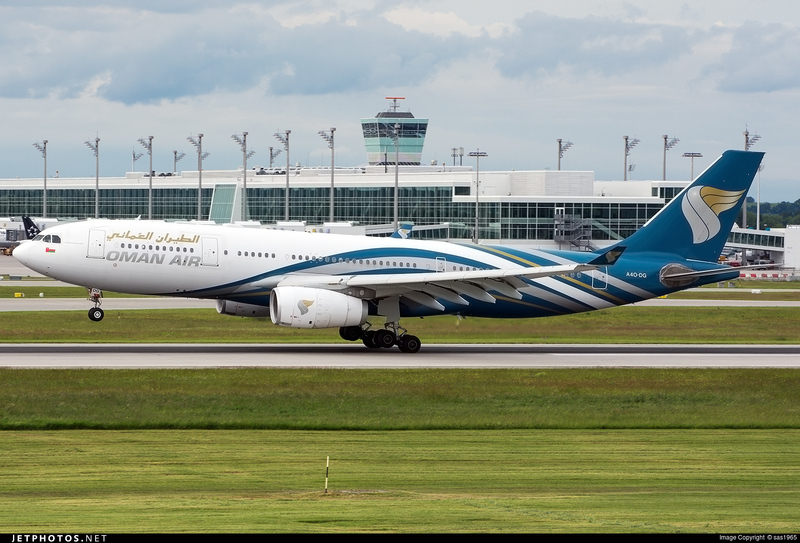 Unfortunately, the airline doesn't have many partners and for me, none of the mileage cards I use can earn points with Oman Air, so I decided to create an account with this airline's mileage program, another card for my collection. The website is user-friendly and it certainly puts some of the major airline's ones to shame. No problem at all and in fact it was a breeze when I did the booking. Using cookies on your browser, it even stores the history of your searches so if you check in the website after let's say a couple of weeks, the history of the search remains and you can straight away go straight to the selection of seat and prices, no need to search for the dates and destination. That's very convenient if you ask me. 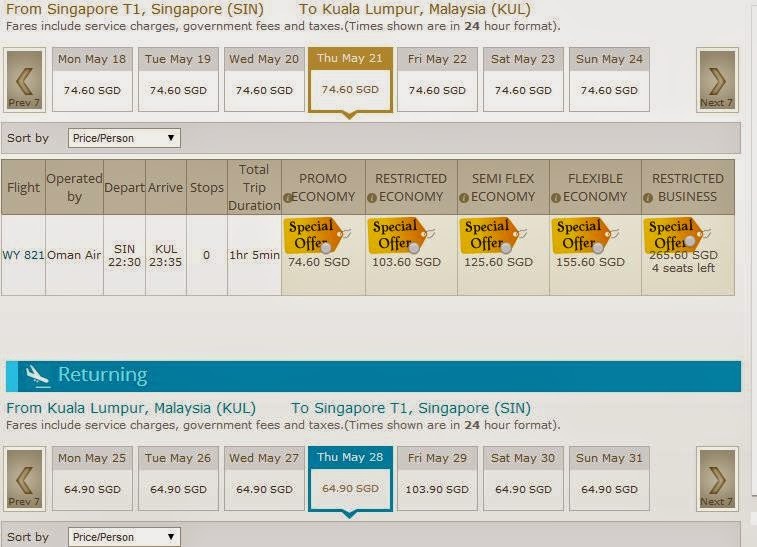 For the price of $139.50 for return trip from Singapore to Kuala Lumpur, it's a bargain. However, the flight timing isn't ideal. SIN-KUL 2230 to 2235 and the return sector timing is 0655 to 0805. Its good for the KUL side, not the Singapore side. I had plenty of choices, so I picked the window seat at the last cabin. 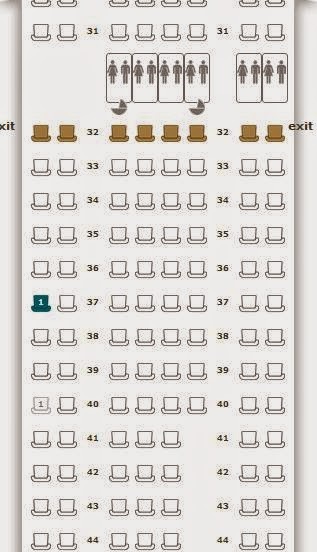 You can choose your seats before making the payment. For such a short sector, it is certainly not worth paying for Business Class. I decided to choose the seat just in front of the engines, to get a wing-engine view when departing from Kuala Lumpur to Singapore. Making the payment is fast and easy, no issue here. Booking was done and I received my confirmed itinerary within a few seconds. Did my online check-in the night before on my Iphone. I took the day off to relax and enjoy some good company at Parkway Parade, met a good friend there. In the evening, I went back home, took my luggage and headed to the airport, terminal 3 to check in. Since Oman Air doesn't offer early check-in, I went there around 6.45 pm and the counters were opened by the time I reached there. The counters were empty when I was there, got my boarding pass within minutes. The counter staff was quite new so he was assisted by a senior staff. They encouraged me to sign up for the airline's membership card, and I did. Adding another airline card to my collection is definitely satisfying. 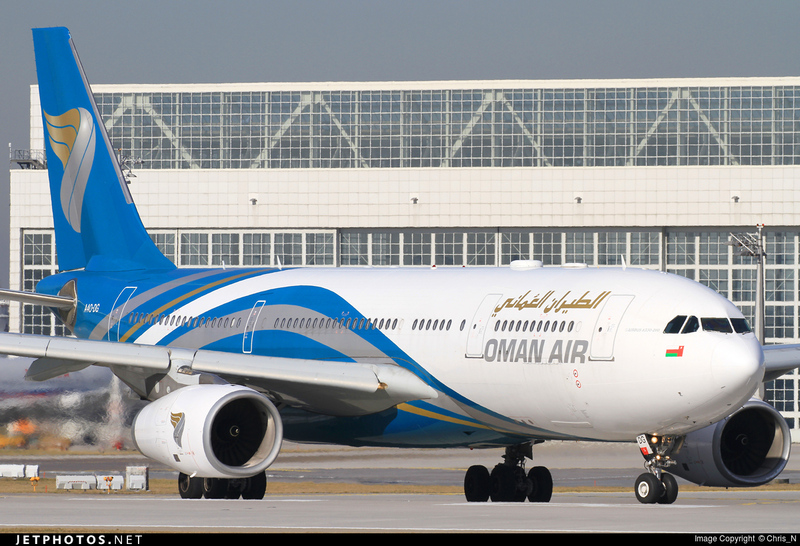 Nice to add Oman Air to my list of airlines - my 75th airline in my flight logbook. Very nice boarding pass - luckily they took the smaller portion during boarding. Perhaps to Muscat the next time I fly with this airline. For a 50 minutes ride, its too short to enjoy. After checking in, I went to the Singapore Food Street at the airside to try out one or two local dishes. I heard negative reviews about the food quality, so decided to try it out myself. I had the chicken rice, unfortunately I forgot to take a photo of it. It was average, can't be compared to the better ones out there. For the price of $6.50, it wasn't worth it. 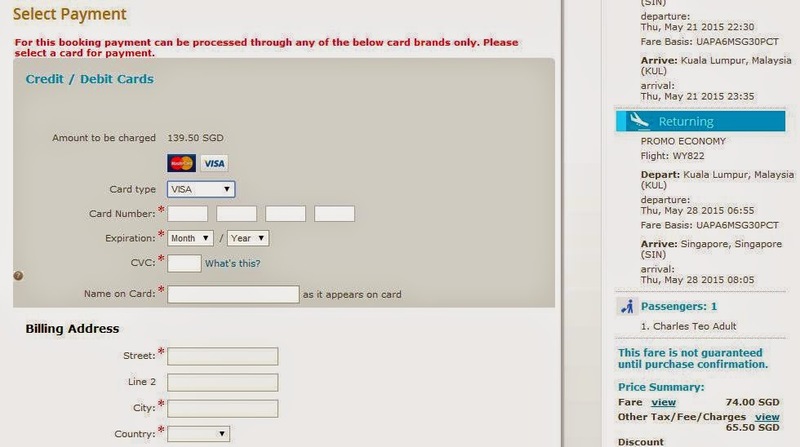 Do take note that you have to buy a card in order to make your purchase. The left over value can be refunded, no deposit is required for this card. I wasn't full after the meal so I went over to the Donut section to purchase a couple to enjoy. I had the salted caramel and white chocolate donuts. While eating, I did a check on flightradar24 to check what aircraft was I flying on. Once my stomach was satisfied, I headed slowly to the gate. My flight was departing from Gate A13 and it was opened by the time according to this monitor screen. However, when I reached there, the staff were chatting away and one of them was not even sure whether it was opened!! It took half a minute before I was allowed to go through security and to the holding room. There is Free WiFi available to kill the time, also you can charge your phones at the limited charging station. However if you need to go to the toilet, you can hand over your boarding pass to the staff and head there, a bit inconvenient especially if its crowded. Most of the passengers were on transit. For passengers that are flying on the same airline but is on transit at Changi are required to leave the aircraft so that cleaning can take place and also security checks for both transit and new passengers. Looking at the number of passengers, there weren't too many, I guess it was not a full flight and it was the case after have a quick look after the aircraft pushed back. My seat was vacant, so were a few rows at the rear. Unfortunately, there was this group of passengers behaving loud and rowdy, causing inconvenience to the flight attendants and to the fellow passengers on board. Fortunately, they quieten down after take off. After the aircraft touched down, the silence in the cabin was ruined by one of them playing his portable game, blasting the volume. Electronic devices are allowed to be used from gate to gate, but the IFE system was only activated after the safety video was finished. Safety video was played first in its local language and then in English. Took a bit longer for it to finish, but we were still taxiing. "Turn to your right and your seat is at the next cabin, enjoy your flight!" The crew at the rear greeted me when I looked at them, they were pretty nice and hospitable, I was lucky to get this good set of crew. While they were busy preparing the cabin and welcoming more passengers, I took the chance to snap some shots! Here are the photos consisting of both Economy and Business Class. Business Class Cabin - the old products which in my opinion is better than the new one. 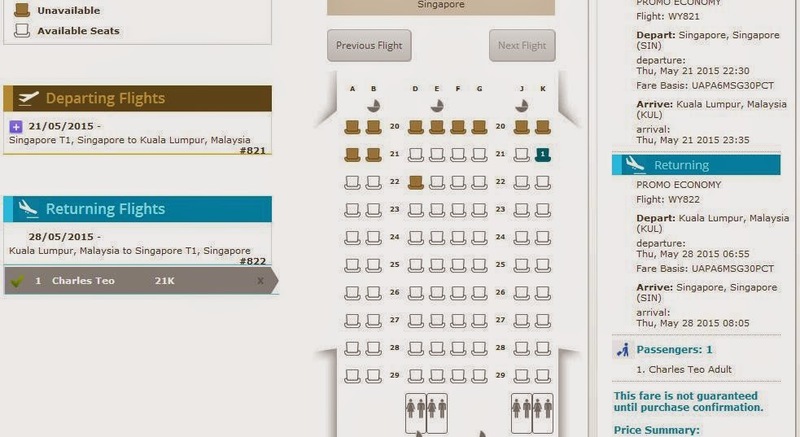 This seating arrangement is in a very comfortable 1-2-1 layout, the new one is 2-2-2. The seats do look very comfortable. I like the colours of it; warm and cozy yet it has the luxurious feel to it. This configuration is pretty good for all. You can choose to sit by yourself or with a partner and whatever it is you have an aisle to yourself, which means you won't disturb anyone during the flight. With a huge screen, you are able to enjoy the movies as the flight time passes by. Unfortunately, this IFE system doesn't offer much contents like the ones on Emirates and Singapore Airlines for example, so that is one of the very few disappointments. At the ottoman, there is blanket for you to use at any time during the flight and you can store your shoes in it. For cabin sized luggage, you can store them at the over head cabin at the side. The middle part of the cabin has no overhead luggage compartment which is good, giving it a more spacious look to the cabin. You can store your items in the storage compartment, just don't forget to take it after your flight. There are cases of passengers leaving their Ipads or other expensive items in it. What do you think of the cabin? Its a pity that its being replaced by the not so popular 2-2-2 configuration. It certainly beats some of the airline's first class seats. 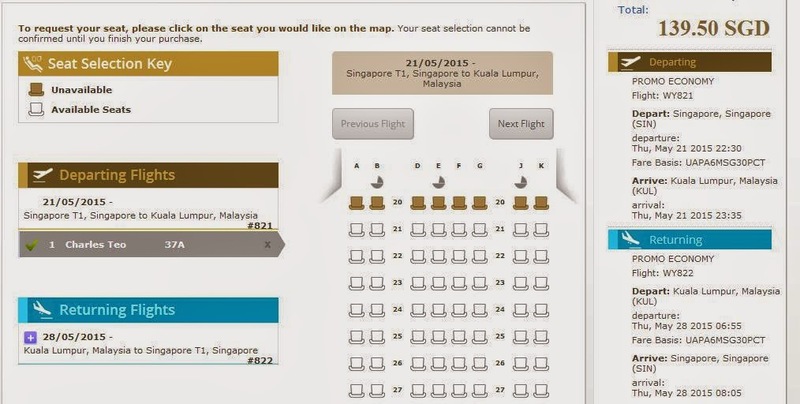 This is the new business class seats: 2-2-2 , click here! In my opinion, I prefer the current ones. A photo of me taken by a fellow passenger. For a short haul flight, flying on Economy Class is the only option and after experiencing it, I feel its one of the best out here. 2-4-2 layout with a comfortable seat pitch with good IFE system and seat cushion, no problem for me on long haul flights. I love the colours of the seat and the crew's uniform matches it. Taking photos of the cabin was not an issue with this set of crew. I always choose the 2-seater when flying on the Airbus A330/A340. The IFE system of the Economy Class is pretty decent, you can either use the touch screen or remote control. Using the touch screen is responsive and the system is user-friendly. The only down side of it is the choices of movies are limited. I prefer the 787 Dreamliner's Boeing Sky interior to the Airbus' cabins. 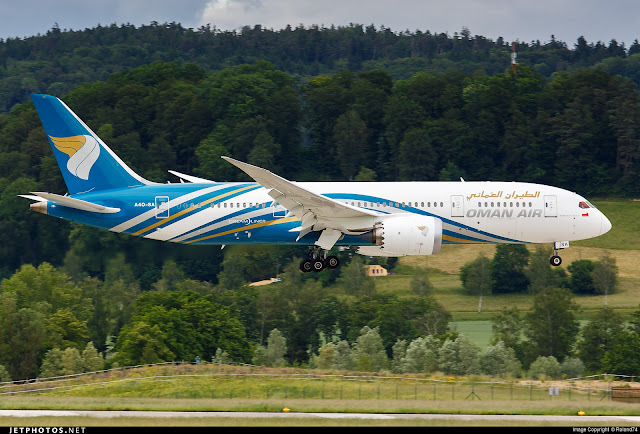 This airline has ordered a few 787 Dreamliners and I can imagine how nice the cabin will look, blending in with Boeing's interior which in my opinion is nicer and more comfortable than Airbus'. The advantages of the A330 comparing to the Boeing 787 Dreamliner has is its more comfortable layout of the 2-4-2 and the quieter cabin. This is my seat, legroom space is 34' inch. Every passenger is provided with a pillow and blanket. The seat pouch contains the safety card, magazines and the vomit bag. More photos of the Economy Class Seats. What do you think? More passengers coming in and most of them were transit passengers. These photos were taken during take off. Once the seat belt sign was switched off, I took a few shots of the cabin before making my way to the lavatory. The rear was empty, so I managed to snap some of these shots, no one bothered with my activity. That's a good thing! The aircraft was making a turn when I took this photo. For a short flight, the crew distributed snack and drink for each passenger. So far, this airline along with Malindo Air serve snack on this short sector. Once the lights was up, I quickly snapped a few more shots! That's how empty the rear was and I got a few stares this time round. Photos taken just at the end of the flight. This is the last row of the 2nd cabin, this seat can be reclined. Its time to leave the aircraft and the short flight came to an end just like that. I think the airline has done well in designing both the Y and J class cabins, both products are better than a lot of products out there and you can say its competitive against the major 3 players: Qatar, Emirates and Etihad. Of course Oman Air, doesn't have the network, the number of aircraft and financial means to compete with them, but with the current CEO in charge, they are in good hands to give the others a run of their money! The seats are comfortable with ample legroom space, and that gets my thumbs up. In-flight WiFi: This is one of the first airlines to introduce the online WiFi, unfortunately it was not switched on, on my flight, so can't comment. Do note that only Airbus A330 in the fleet offers WiFi. AC Socket (Switched off) and internet connection port for your laptop. Safety video demonstration - always good to pay attention to it. I always believe in pausing whatever one is doing and pay attention to it, it won't take too much of your time. Once the demonstration is over, we were allowed to use the IFE system - a good time to check out the system. Just like the cabin, the IFE system impresses me. In-flight map is one of my favourite and this was a pretty good program, you can use your fingers to adjust the angle of the aircraft to whatever you like. At this point, we were still at our gate waiting for push back. Very useful for day flight. I usually use this during take off and landing in daylight. How about the movies? The selection is limited but it shows the latest movies at least for the Hollywood section. You can also use the internet via this IFE system but you have to pay to use it. For this flight, the OnAir WiFi was not available. At this point, we started our descend. I am impressed with the IFE system, especially with the camera views. Airline's safety card applies to both Airbus A330-200 and -300 series. I was surprised to receive a snack, was only expecting a drink on this leg. The cookie is delicious and is usually served on the Singapore to Kuala Lumpur sector. 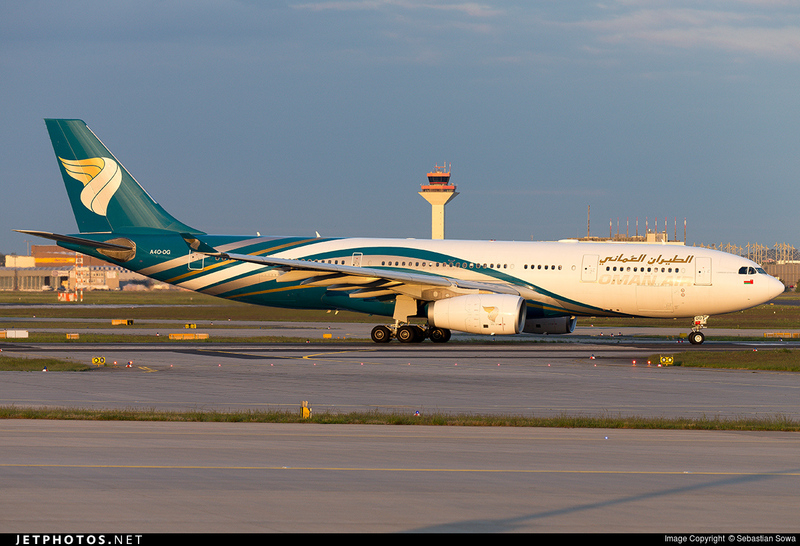 Oman Air departs from Terminal 3, and we were parked beside a Singapore Airlines Boeing 777-300ER, 9V-SWF. Off we go, climbing smoothly into the sky. If you see this view, you know you are in Singapore. Caught sight of Changi Airport, what a view! We have entered the Malaysian Peninsula. Few more turns and we were on final approach before landing smoothly on KUL's runway 32 Left. Touched down at KUL, the flight went past too fast for my liking. Passing by 9M-MNF, the last A380 in its fleet. Korean Air's Boeing 777-300ER had just pushed back and its loud GE90-115B engine start up could be heard. We reached our gate after 15 minutes of taxiing. I heard so much about this and when the chance arose to fly with airline, I grabbed it. Looking at the photos on the internet, I am deeply impressed with the cabin interior in both J and Y class. Just like the other local aviation enthusiasts, we were delighted when the airline announced flights to Singapore and the better news is that we could fly with this airline without the need of flying to its home base; 5th freedom flight from Singapore to Kuala Lumpur. So once that was confirmed, I made my booking - one of the easiest decisions made. The flight timing may be bad, but I managed to work it out. Taking advantage of the introductory fare, I got myself a bargain. One of the cheapest fares for a premium cabin and it cost less $15 lesser than my one-way ticket on Uzbekistan Airways - you can check out the trip report over here. After experiencing this short flight, I am definitely impressed with the cabin products and the crew, will be more than willing to fly this airline on longer sectors and perhaps to Europe in the near future. This airline is the top of the list. Thanks for reading! Hope you have enjoyed this trip report. Thanks Charles. I bumped upon this flight option. Not sure how it was. Great blog! Your blog helped me understand and I will give it a try too. 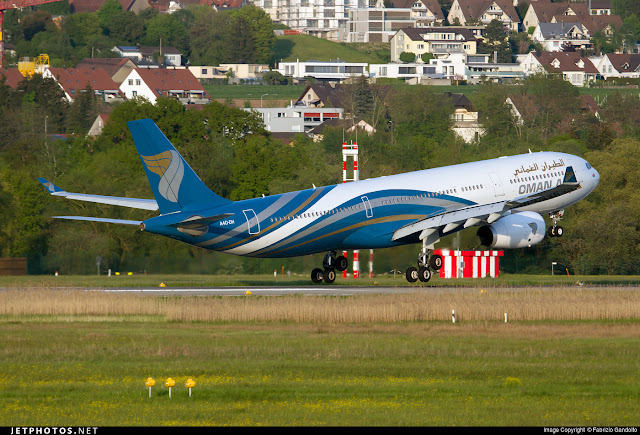 Hope you enjoy your flight with Oman Air, they are one of top airlines around. 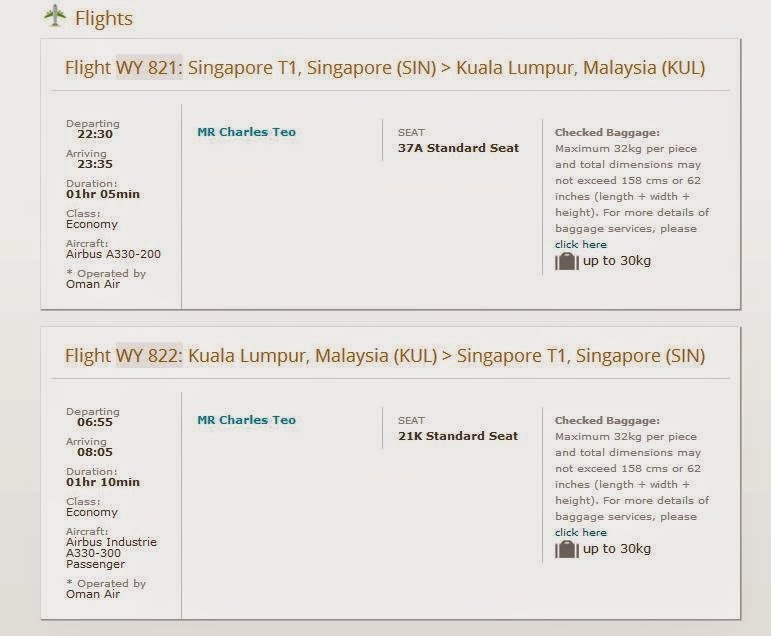 You can also credit WY flights to your Etihad account, their only partner airline. Yes, the airline has stopped flying SIN-KUL-SIN sector for quite some time already. Looking forward for more posts like this one. Indeed, it is one of the best air flight i've ever experienced. Thanks for the very detailed report. It's a lesser known airline but I agree they offer a good experience. Just reviewed Oman Air Business class on the a330-300 and was very impressed. Value for money, around 1000 EUR for +18h airtime (no special promotion or error fare, regular fare). Keep up the cool review!